ODNR Director James Zehringer in the center holds his piece of ribbon high at the dedication of the Mt. Gilead State park dam and spillway. He is pictured with members of the Mosser Construction Company that worked on the dam, local officials and Volunteers In the Park. The new labyrinth spillway, topped by a walking bridge, at Mount Gilead State Park is the first of its kind in Ohio. 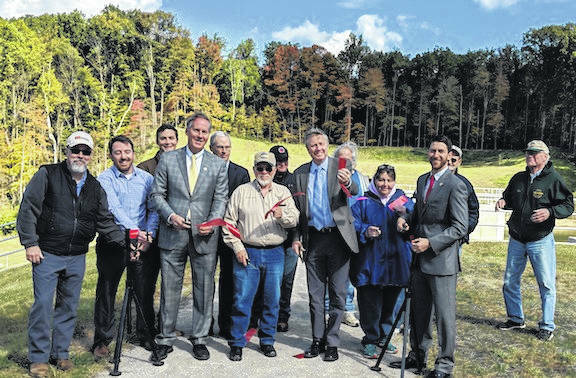 MOUNT GILEAD — A perfect, sunny fall day was the setting last week for the ribbon cutting and dedication that signaled the completion of construction work at Mount Gilead State Park. Ohio Department of Natural Resources Director James Zehringer spoke about the importance of the reconstruction of the Mount Gilead park dam and spillway as part of the statewide initiative of ODNR to repair and rehabilitate state owned dams. The Mount Gilead State Park dam was one of 56 Class I high hazard potential dams in the state when it was evaluated a few years ago. This was due to deficiencies of severely deteriorated concrete and instability in the dam embankment. The conditions combined to result in a low safety level for the potential loss of residences, businesses and for the possible loss of human life downstream. Zehringer spoke about the improvements of the new Labyrinth spillway, the increased height of the dam embankment from 20 to 30 feet, and the increase in length of the dam from 525 to 600 feet. He also noted that increase in tourism for the area would also help local businesses. Zehringer thanked the park VIPs for their dedication and work at the park as well as their donation of 14 benches throughout the park. Joe Kudritz, Engineer with Michael Baker International spoke about the major project of rebuilding of the dam, embankment and spillway. 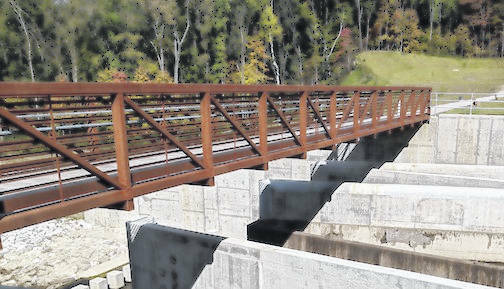 He called the work on the upper dam “touch up work,” with a walking bridge to be completed at the upper dam this month. “The focus of the project is to make the park usable for the public,” Kudritz said. He also pointed out that the construction company made the barrow pit to the north of the dam a “usable space” for park visitors. Kudritz was enthusiastic about the hydraulics of the new dam that allows more efficiency for the spillway with the raising and lowering of the lake. Rusty Parker of the Mosser Construction Company spoke about the highs and lows of working on the project over the past two years. He was proud that his workers had persisted through some very cold winter weather to finish the project they began in 2016. “It’s a project that will mean a lot to us for many years to come,” Parker said. Steve Harvey, Assistant Chief of Ohio State Parks and Watercraft, said it was a good opportunity to rebuild the park trails to prevent erosion. They were also able to increase the length of the trails to a total of six miles. They are still working to complete the trail signage and will be working on the lower parking lot next spring. County Commissioner Tom Whiston and Ohio State Representative, Riordan McClain thanked state officials for the $7.4 million dollar investment in the park.